The aim of this blog is to help you prepare your garden for summer in good time. With the little time we have available to be out there, it might as well be spent on those tasks that are really going to make a difference. A small amount of targeted and efficient work now will save so much time later. Then you`ll be left to think what to do with your freed up time from your deck chair. 1. Assessing a section of a planting bed. Like myself, you may have a mix of evergreen and deciduous shrubs with herbaceous colour below. When first planted there was probably a well-defined discipline to this area, but maybe now there is a situation where a number of things have happened to upset this original plan. For instance, the vigorous shrub species are now adversely dominating the bed, or at the lower levels plants are thinning and have less influence. Some of the under planting may be leaning towards the light and be misshaped as a consequence. Other plants may just not be up to your expectations allowing you to introduce new species that you may have fallen in love with since the original scheme. All of this provided new opportunities and potential for an area that you`ve secretly been itching to have another go at. Most shrubs, as you know will respond well to some aggressive pruning and reward you with better colour, foliage and structure as a result, but it needs some courage to hack away, so my advice is to research the species to establish the correct pruning season so that you don`t chop off all this year`s flower and then just go for it. This will then open up the bed then concentrate on the smaller shrubs, which if necessary should have the same treatment. That then leaves the herbaceous species below. You have a few choices here, but first of all take out those that are dead, weak or just not up to scratch. If you are then left with gaps, you can either lift, divide and plant the divided plants to fill the gaps or choose new species that you`d like to see interact with the current planting. Just remember that planting in organic shapes with odd numbers seems to work somehow. Plant in drifts of five, seven or nine at a go, it`s so much more effective. 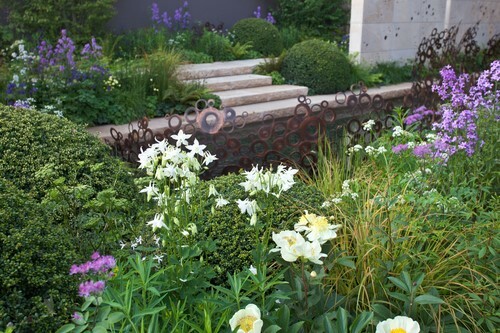 Every garden design in Gloucestershire I’ve been lucky enough to design and build has had a signature method of planting design tailored to the scheme. However, over the years the most well received technique I`ve witnessed and implemented is to not necessarily have the tallest at the back. 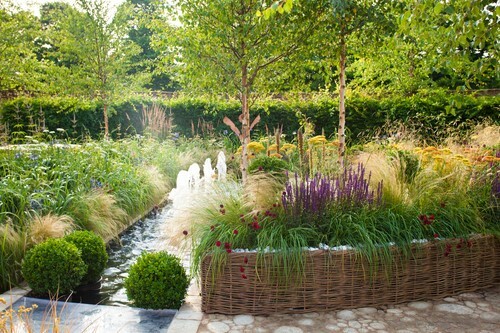 Bring spires such as Delphinium, Foxgloves, Verbena bonariensis and Irises to the front. It can make the border look deeper without blocking the view and they won`t flop on to the lawn. Double up on planting on areas by interplanting Hostas with Agapanthus or Sisirhrinchium striatum with Gypsophylla `Rosey Veil`. Seeing those evergreen blades rising out of a cloud of little stars always puts a smile on my face. Plant different textures next to each other such as Euphorbia martinii close to Stipa tennuissima or Calamintha nepeta next to Rosemary `Jessup`s Upright` There are numerous dimensions to consider when designing a planting scheme so keep the following in mind when even considering a small area of improvement. Height, flower colour, leaf colour and texture, flowering time (very important to have all year round interest) and habit. This is a massive subject but if broken down to two simple requirements, a plant needs a background of nutrients assisted by mycorrhizal activity provided by rotting matter to convert the nutrients into a form it can absorb and then small air pockets around the roots to aid root movement and gaseous transfer. Get this right and the plant will be transformed. Moisture, although necessary in dry periods is not so much of a requirement for most of the year. To combine the two requirements in one action, just fork in a well rotted manure to a good depth to loosen up the soil whilst incorporating the rotted material laden with usable nitrogen and good bacterial matter. Then use an organic slow release fertiliser such as Blood, Fish & Bone scattered over the top at a rate of about one handful per square metre. Rake it in if you wish, but this will break down over a year and provide further complex nutrients. When planting a new plant this is easily done by incorporating these two materials into the backfill of soil round the plant. I should have said that before you start on the border you should remove any weed growth as by the time you`ve padded around these might be lost only to reappear later. My secret weapon is a Sneeboer Long Handled Half Moon Hoe. This is a pull hoe with a six foot long handle and a very sharp blade. It`s effortless weeding that`s very satisfying with no bending. Hoeing should start from the back of the bed so you don`t walk on (and therefore replant) what you`ve just dislodged. Try and do it on a dry, warm, windy day. Most weed seedlings with roots exposed to these conditions will be unable to recover from having their roots exposed within about twenty minutes. Even the most pernicious weeds will succumb to a sharp hoe. You may have inherited a terrace laid in a hurry with no foundation. We lay everything on a concrete foundation so that you can have confidence that your premium quality new paving slabs will look good over many years without the grouting falling out allowing the weeds to appear. Stonemarket have a huge array of paving types to suit most designs, whether contemporary using their Stonespar blocks or their Millstone paving slabs for a English country garden look. In summary, all the above will revive a border that would have otherwise continue to get out of control by just doing what it wants to do without human interaction. This I suppose is the definition of gardening. Nick Dickinson of Elementa Design has been creating beautiful gardens for four decades now. 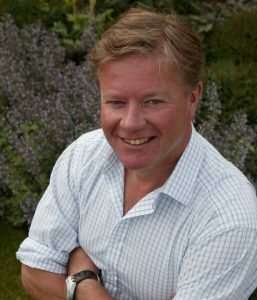 Nick is a much sought after plantsman and garden designer based in Gloucestershire who is able to take a planting brief, however sketchy and transform your garden into something that will really stimulate the senses.